The Dividist Papers: Obama Endorses the Bush/Cheney Unitary Executive. Again and again and again. Obama Endorses the Bush/Cheney Unitary Executive. Again and again and again. It was the most seductive argument to vote for Barack Obama - We need to elect a Democrat to "undo the damage" of the Bush administration. Although I agreed with the diagnosis, I could not concur with the treatment. The toxic side effects of Single Party Rule presented a greater risk than the potential benefit of curing the Bush/Cheney unitary executive disease. In particular, the prospect of the new President inheriting the expanded Bush/Cheney presidential power while his party held larger majorities than enjoyed by George W Bush and the Republicans was particularly frightening. Those fears were confirmed last week, when a very bad stimulus bill steamrolled a neutered Republican party, handing future generations more debt and putting the economic future of the country at risk. That said, I expected to enjoy a couple of consolation prizes with the Obama victory. First, balance would be maintained in judicial appointments and on the Supreme Court, and second - Obama would indeed roll back some of the worst offenses of the Bush administration.While I still have high hopes for the first consolation prize, early indications are not promising for the second. Not promising at all. 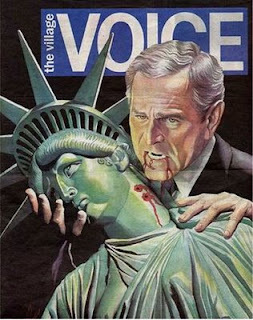 Looking Back - The bad old Bush era. As there is a lot of damage to undo, let us first put this in perspective by taking a walk down memory lane. The most egregious offenses of the Bush/Cheney administration fall under the umbrella of expanding executive branch power at the expense of the legislative and judicial branches, with a commensurate erosion of constitutional protections. The worst of these occurred between 2000-2006 when the Republicans had control of both the executive and legislative branches. Details of many of the abuses under the expanded Unitary Executive branch first saw the light of day with congressional investigations initiated after 2006. Those revelations only came to light after divided government was restored with the Democrats taking majority control of the legislature (along with the subpoena power that accompanies majority control).This, of course, begs the question -With Single Party Rule again ascendant in Washington, who will investigate and provide oversight of the Obama administration? "The fantasy of total control has emerged as central to the Bush administration imagination. It comes out in the unguarded utterances: the aide who blurts to a New York Times reporter that he was just one more sad-sack member of the "reality-based community."... It shows up in the tautological narcissism of Bush's National Security Strategy document, which actually uses the phrase "the best defense is a good offense," and artfully constructs a vision in which whatever the United States does to preserve its interest is always already "peaceful," even when it requires war... The manifesto takes on ominous overtones when read alongside the famous post-9-11 draft Pentagon report that establishes a royalist conception of "sweeping" executive power as the only way to keep us safe: because "national security decisions require the unity in purpose and energy in action to characterize the presidency rather than Congress." Equally alarmed by the "royalist conception of sweeping executive powers", many libertarians found common cause with liberals, as dispassionately documented in the Cato study: "Power Surge: The Constitutional Record of George W Bush'"
I know it has only been a month, but Obama works fast. It is time to checkpoint how President Obama is progressing on "undoing the damage" of the Bush/Cheney Imperial Presidency. There is some good stuff. The executive order to close Guantanamo in a year or so is very positive. But on balance... So far... not so good. The Obama administration supports Bush era invocation of state secrecy to protect rendition and torture. "After the British High Court ruled that evidence of British resident Binyam Mohamed's extraordinary rendition and torture at Guantánamo Bay must remain secret because of threats made by the Bush administration to halt intelligence sharing, the Obama administration told the BBC today in a written statement: "The United States thanks the UK government for its continued commitment to protect sensitive national security information and preserve the long-standing intelligence sharing relationship that enables both countries to protect their citizens." The following can be attributed to Anthony D. Romero, Executive Director of the American Civil Liberties Union: "Hope is flickering. The Obama administration's position is not change. It is more of the same. This represents a complete turn-around and undermining of the restoration of the rule of law." The Obama administration supports Bush era executive state secrecy claims to deny torture victims their day in court. "What makes this particularly appalling and inexcusable is that Senate Democrats had long vehemently opposed the use of the "state secrets" privilege in exactly the way that the Bush administration used it in this case, even sponsoring legislation to limits its use and scope. Yet here is Obama, the very first chance he gets, invoking exactly this doctrine in its most expansive and abusive form to prevent torture victims even from having their day in court, on the ground that national security will be jeopardized if courts examine the Bush administration's rendition and torture programs -- even though (a) the rendition and torture programs have been written about extensively in the public record; (b) numerous other countries have investigated exactly these allegations; and (c) other countries have provided judicial forums in which these same victims could obtain relief... What this is clearly about is shielding the U.S. Government and Bush officials from any accountability. Worse, by keeping Bush's secrecy architecture in place, it ensures that any future President -- Obama or any other -- can continue to operate behind an impenetrable wall of secrecy, with no transparency or accountability even for blatantly criminal acts." The Obama Administration supports invoking Bush era state secrecy to protect executive order illegal wiretapping and domestic surveillance. "For the second time this week, the Obama administration has gone to court in San Francisco to argue for secrecy in defending a terrorism policy crafted under George W. Bush - in this case, wiretapping that President Obama denounced as a candidate... The dispute involves Walker's Jan. 5 order to allow plaintiffs who say the government illegally wiretapped their phones to read a classified surveillance document that could confirm the assertion and avoid dismissal of their suit. Lawyers for the Obama administration say the judge's decision "presents a clear-cut conflict between the court and the executive branch." Out of fairness, I should point out that this last should not be a surprise. It is completely consistent with the July, 2008 version of Barack Obama who voted against the rule of law and in support of immunity for Telecom companies who cooperated with illegal government wiretap requests. OTOH it is a flip-flop from the January 2008 version of Barack Obama who promised to support a filibuster to prevent granting immunity to Telecom companies. The Obama Administration opposes torture. Unless - you know - they decide they really need it. "As I noted here yesterday, human rights advocates think that the executive order outlawing torture that President Obama signed yesterday preserves some wiggle room... Obama very strongly denounced torture yesterday as he signed the order outlawing it. But it’s nonetheless hard to avoid the conclusion that the administration does in fact want to preserve some kind of flexibility here, for reasons that are not yet entirely clear, at least to me." The Obama Administration continues Bush-era unconstitutional blurring of the principle of Separation of Church and State. "...there was reassuring language about maintaining the separation of church and state in Mr. Obama’s remarks at the National Prayer Breakfast preceding the issuance of his order, and in the order itself. But it would have been a lot more reassuring if the directive had actually revoked Mr. Bush’s 2002 executive order authorizing religious-oriented recipients of federal funding to hire and fire on religious grounds.We suspect that Mr. Obama was not particularly proud of this omission. He chose to sign his order away from the view of television cameras or an audience. Joshua DuBois, the Pentecostal minister selected by Mr. Obama to lead his initiative, says the president is “committed to nondiscrimination,” and that the executive order “provides a process” for case-by-case review to decide if grants to faith-based organizations are “consistent with law.” What process? The executive order says only that White House officials “may” seek Justice Department guidance if questions arise about particular grants. Discrimination by faith-based grantees should be barred.The case-by-case review seems destined to confuse as much as enlighten. And it is hardly the clear commitment to proper employment practices Mr. Obama voiced as a candidate, and the Constitution requires." There are some other areas where the Obama administration appears to moving closer to the style and substance of the previous administration. Among them: Obama continues the much reviled White House Political Office - former home of Karl Rove; Obama appointed a political hack to the office of the White House Counsel, further opening the administration to comparisons with the Bush/Rove White Houses - and - while we are on the topic of Karl Rove; The Obama administration will apparently not challenge the constitutionally questionable Bush administration claims of "executive privilege" shielding Karl Rove from testimony before the legislature in the matter of U.S. Attorney General firings. During the FISA debate, Markos Moulitsas asked "Where are the Libertarians?". He obviously was not looking very hard. No matter. As we now watch Barack Obama embrace and defend the Constitution trampling, power grabbing excesses and abuses of the Bush/Cheney imperial presidency, it is time to ask "Where are the Liberals?" Or at least Kos? There are some DailyKos community diaries qu0ting Greenwald, but I cannot find a story from him in the last two weeks on Obama's Justice Department defending these Bush administration positions. There is a lot happening on that site. Maybe I missed it. "During the 2008 election, Obama co-opted huge portions of the Left and its infrastructure so that their allegiance became devoted to him and not to any ideas. Many online political and "news" outlets -- including some liberal political blogs -- discovered that the most reliable way to massively increase traffic was to capitalize on the pro-Obama fervor by turning themselves into pro-Obama cheerleading squads.... on one issue after the next, one can vividly observe the harm that comes from a political faction being beholden to a leader rather than to any actual ideas or political principles." Greenwald's analysis is instructive. It explains why so many on the left greet Obama's support and active defense of the Bush/Cheney model of the unitary executive with a yawn. It is not the principle of checks, balances and constitutional protections that inform their view of the world. For some (many?) on the left, it is about blind loyalty to a leader and a party. From their perspective, Bush/Cheney executive power is not a problem if Obama is in the White House. Apparently, with the ring of power in Barack Obama's benevolent hands, the Bush/Cheney executive power will only be used for good. 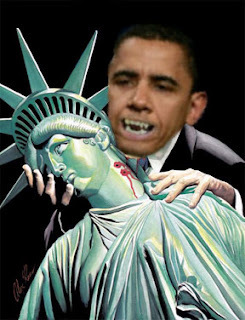 Just put your trust in Barack -not in the rule of law - not in the Constitution - but in the man. These Obama supporters resemble nothing so much as the right-wing apologists for Bush administration excesses. "What we need far more than a benevolent and magnanimous President is a re-assertion of Congressional authority as a check on executive power. Even if Obama decided unilaterally to refrain from exercising some of the powers which the Bush administration seized, that would be a woefully insufficient check against future abuse, since it would mean that these liberties would be preserved only when a benevolent ruler occupies the White House (and, then, only when the benevolent occupant decides not to use the power). Acts of Congress -- along with meaningful, enforced oversight of the President -- are indispensable for preventing these abuses. And that's true whether or not one believes that the current occupant of the Oval Office is a good, kind and trustworthy ruler." Under the current incarnation of One Party Rule, the Republicans are impotent in the face of Obama and his large Democratic majority. The only hope for any moderation of the power of this presidency, must come from principled civil libertarian Democratic legislators in Congress (Feingold, Feinstein, and Leahy are stepping up). The only hope for economic sanity, must come from Democratic fiscal conservatives like the few Democratic representatives in the House of Representatives that voted against Porkulus. In this post I criticize Barack Obama policies. For the benefit of any readers of a left leaning partisan inclination who cannot tolerate such criticism, nor read criticism of his policies without assuming the source to be their right-wing partisan doppleganger, I offer these links. A selection of past posts from this blog on issues that are more important to DWSUWF than the party or personality inhabiting the White House. Including: The Patriot Act, the Military Commission Act and excutive branch preemption of Habeas Corpus; The FISA capitulation bill and erosion of 4th Amendment search and seizure protections, Torture and renditions in violation of the Geneva Convention; The principle of Separation of Church and State; Executive branch usurpation of congressional war power oversight; and 1st Amendment free speech protections. We don’t place faith in the Goodness and kindness of specific leaders — even Barack Obama — to secretly exercise powers for our own Good. We rely instead on transparency and on constant compulsory limits on those powers as imposed by the Constitution, by other branches, and by law. That’s what it means to be a nation of laws and not men. When Obama embraces the same abusive and excessive powers that Bush embraced, it isn’t better because it’s Obama rather than Bush wielding that power. It’s the same. And that’s true even if one “trusts” Obama more than Bush"
I'd like be optimistic on this subject, but am having a hard time getting there. As I said, what hope I do have comes from the Democrats in Congress who are moving to begin the process of restraining executive power, and/or in the hope that Obama will appoint Supreme Court justices that will strike down the kind of expanded presidential power that Obama supports. If it does come down to a showdown between Congress and the Executive branch, it’ll be interesting to see what the Republicans do. Obama may very well find common cause with many Republicans to preserve the Bush/Cheney expanded powers. An excerpt of this post was cross-posted at Donklephant, where you'll also find an interesting comment thread. Surprisingly, not everyone agrees with me. Can you please clairfy something you wrote at the start of this post. It said you were hopeful when Obama won because of the need for "judicial balance." I assume you are referring to the need to appoint left wing judges to balance out right wing judges appointed by Bush. I remember from 2001-2007 a major reason that Democrats used to block judges was "balance" - because Republicans controlled Congress and the White House, things needed to be balanced in the courts. I think you got my meaning exactly. GWB got a couple of Supreme Court picks, and I hope to see Obama get a couple seated. I also have no problem with Republicans fighting to block picks they find particularly objectionable, just as the Dems did. Hopefully that will keep Obama from moving too from center with his nominations. I don't think there are enough libertarian leaning judges out there that will align with my views, so the best I can hope for is a right-left balance and HOPE™ that tension will limit the damage to both our civil and economic liberties. What can I say, you basically play right into the hands of the right with your criticism of Obama. Anyway I see the chance of another Bush being elected as basically zero, authoritarianism does not manifest on the left. 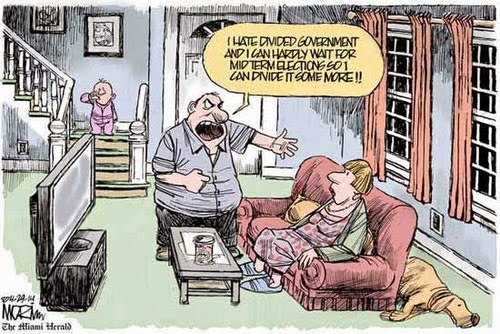 With the demographic changes in America someone like Palin just won't be able to win. So the question of executive powers is basically a non issue. Bruce - What can I say... I don't care if I am playing into the hands of the right when the left is in charge and I don't care if I play into the hands of the left when the right is charge. Our system is built on the premise that you build institutional checks and balances between co-equal branches of government. When we have one party rule by either party those checks and balances are undermined, there is insufficient oversight of the executive branch, and power is concentrated. Your statement about authoritarianism being absent on the left is laughable nonsense. Authoritarianism is vested in the institution and the Executive branch is where it can manifest - if there is insufficient checks, balances and oversight. I don't particularly care if you are fine with the executive wielding extra-constitutional power when your party is in power. I'm not. If if was bad for Bush to wield that power then it is just bad for Obama to wield the same power. To say anything different is blatant hypocrisy. A benevolent leftist dictator is still an dictator. We need Congress to do their job and keep the executive in check. that only seems to happen when at least one house of congress is not of the party of the President. 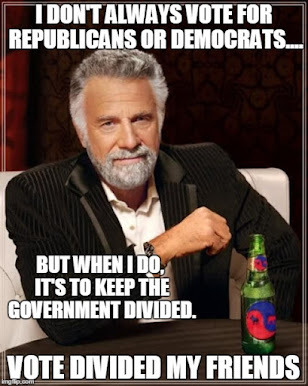 I vote and advocate for either party in the most direct manner to keep it divided. ROFLMAO. Ow my ribs hurt.